Follow the Chamber on Twitter and connect on Facebook. Columbia is a wonderful place to live and work. That’s not exactly a bold statement, but we have a vibrant community comprised of people of all ages, and a business community that is strong, competitive, and supportive of each other. The Columbia Chamber of Commerce has a big hand in cultivating that kind of culture in Columbia. 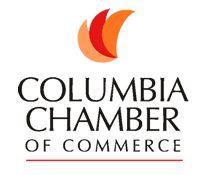 The Chamber serves as the “front porch” when new businesses are checking out Columbia. Don Laird and the team at the Chamber not only make sure new businesses are welcomed in Columbia, they’re actively searching for new businesses to bring to Columbia. If you think about our business community as a body of water; the Chamber is ensuring it’s a river rather than a farm pond; fresh and moving rather than still and stagnant. There’s much the Chamber does every day to make sure Columbia is always moving forward. We haven’t gotten companies like IBM to Columbia simply because they like the taste of Shakespeare’s Pizza (though that’s enough to make many people come here). Hard work, handshakes, and a desire to make Columbia a sought after destination for businesses are all reasons our Chamber is at the forefront of growing business here. What do you think of our Chamber?